The Tyva Republic (Russian: Респу́блика Тыва́, Respublika Tyva; [rʲɪˈspublʲɪkə tɨˈva]; Tuvan: Тыва Республика, Tyva Respublika, [tʰɯˈʋa resˈpʰuplika]), Tyva or Tuva (Tuvan: Тыва; Russian: Тува́) is a federal subject of Russia (a republic, also defined in the Constitution of the Russian Federation as a state). It lies in the geographical center of Asia, in southern Siberia. The republic borders the Altai Republic, the Republic of Khakassia, Krasnoyarsk Krai, Irkutsk Oblast, and the Republic of Buryatia in Russia and Mongolia to the south. Its capital is the city of Kyzyl. It has a population of 307,930 (2010 census). From 1921 until 1944, Tuva constituted a sovereign, independent nation, under the name of Tannu Tuva, officially, the Tuvan People's Republic, or the People's Republic of Tannu Tuva. 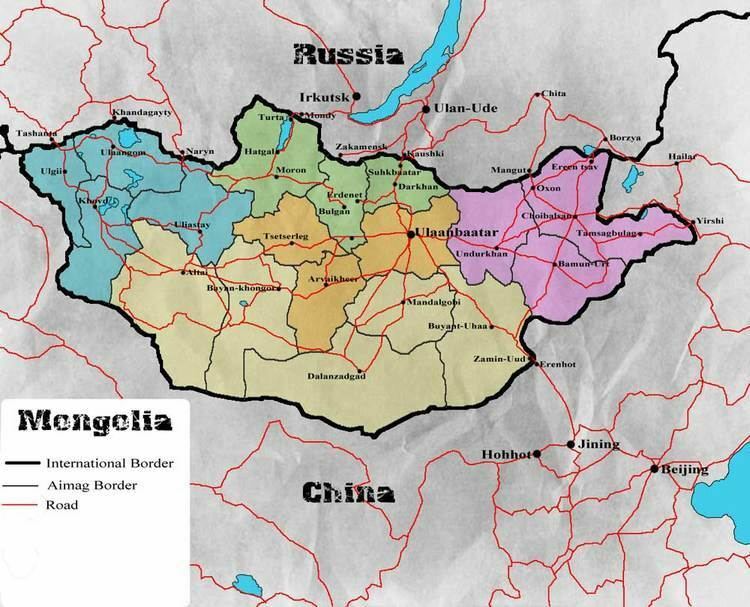 The independence of Tannu Tuva, however, was recognized only by its neighbors: the Soviet Union and Mongolia. A majority of the population are ethnic Tuvans who speak Tuvan as their native tongue, while Russian is spoken natively by the Russian minority; both are official and widely understood in the country. Tuva is governed by the Great Khural, which elects a chairman for a four-year term. The current chairman is Sholban Kara-ool. The territory of Tuva has been controlled by the Xiongnu Empire (209 BC–93 AD) and Mongolian Xianbei state (93–234), Rouran Khaganate (330–555), Mongol Empire (1206–1368), Northern Yuan (1368–1691), Khotgoid Khanate and Zunghar Khanate (1634–1758). Medieval Mongol tribes, including Oirats and Tumeds inhabited in the territory of republic. In 1758–1911 it was brought under Manchu rule. During the 1911 revolution in China, Tsarist Russia formed a separatist movement among the Tuvans. Tsar Nicholas II ordered Russian troops into Tuva in 1912, as Russian settlers were allegedly being attacked. Tuva became nominally independent as the Urjanchai Republic before being brought under Russian protectorate as Uryankhay Kray under Tsar Nicholas II on 17 April 1914. This move was apparently requested by a number of prominent Tuvans, including the High Lama, although it is possible they were actually acting under the coercion of Russian soldiers. A Tuvan capital was established, called Belotsarsk (Белоца́рск; literally, "(Town) of the White Tsar"). Meanwhile, in 1911 Mongolia became independent, though under Russian protection. Following the Russian Revolution of 1917 that ended the imperial autocracy, most of Tuva was occupied from 5 July 1918 to 15 July 1919 by Aleksandr Kolchak's "White" Russian troops. Pyotr Ivanovich Turchaninov was named governor of the territory. In the autumn of 1918 the southwestern part was occupied by Chinese troops and the southern part by Mongol troops led by Khatanbaatar Magsarjav. From July 1919 to February 1920 the communist Red Army controlled Tuva, but from 19 February 1920 to June 1921 it was occupied by China (governor was Yan Shichao [traditional, Wade–Giles transliteration: Yan Shi-ch'ao]). On August 14, 1921 the Bolsheviks established a Tuvan People's Republic, popularly called Tannu-Tuva. In 1926, the capital (Belotsarsk; Khem-Beldyr since 1918) was renamed Kyzyl, meaning "red". Tuva was de jure an independent state between the World Wars. The state's first ruler, Prime Minister Donduk, sought to strengthen ties with Mongolia and establish Buddhism as the state religion. This unsettled the Kremlin, which orchestrated a coup carried out in 1929 by five young Tuvan graduates of Moscow's Communist University of the Toilers of the East. In 1930 the pro-Soviet regime discarded the state's Mongol script in favor of a Latin alphabet designed for Tuva by Russian linguists, and in 1943 Cyrillic script replaced the Latin. Under the leadership of Party Secretary Salchak Toka, ethnic Russians were granted full citizenship rights and Buddhist and Mongol influences on the Tuvan state and society were systematically reduced. Tuva voluntarily became a part of the Soviet Union in 1944, with the approval of Tuva's Little Khural (parliament). The exact circumstances surrounding Tannu-Tuva's incorporation into the USSR in 1944 remain obscure. Salchak Toka, the leader of Tuvan communists, was given the title of First Secretary of the Tuvan Communist Party, and became the de facto ruler of Tuva until his death in 1973. Tuva was made the Tuvan Autonomous Oblast and then became the Tuva ASSR on October 10, 1961. In February 1990, the Tuvan Democratic Movement was founded by Kaadyr-ool Bicheldei, a philologist at Kyzyl University. The party aimed to provide jobs and housing (both were in short supply), and also to improve the status of Tuvan language and culture. Later on in the year there was a wave of attacks against Tuva's sizeable Russian community, including sniper attacks on trucks and attacks on outlying settlements with 168 murdered. Russian troops eventually were called in. Many Russians moved out of the republic during this period. To this day, Tuva remains remote and difficult to access. The Tuvan Railway project under constructions will ease travel impediments to the region. The area of the republic is a mountain basin, about 600 m high, encircled by the Sayan and Tannu-Ola ranges. Mountains and hills cover over 80% of the republic's territory. Mount Mongun-Tayga ("Silver Mountain", 3,970 m) is the highest point in the republic and is named after its glacier. Major natural mineral resources of Tuva include coal, iron ore, gold, and cobalt. Asbestos was formerly important. Wildlife is varied: wolves and bears, snow leopards, ground squirrels, flying foxes, eagles, and fish – some very large. As can be seen above, during the period 1959–2010 there has been more than a doubling of ethnic Tuvans. The Russian population growth slowed by the 1980s and decreased by 50% since 1989. Official languages are Tuvan (Turkic) and Russian (Slavic). Outside Kyzyl, settlements have few if any Russian inhabitants and in general Tuvans use their original language as their first language. However, there is a small population of Old believers in the republic scattered in some of the most isolated areas. Before the Soviet rule, there were a number of large ethnic Russian old believer villages, but as the atheist ideology crept in, the believers moved deeper and deeper into the Taiga in order to avoid contact with outsiders. Major Old believer villages are Erzhei, Uzhep, Unzhei, Zhivei and Bolee Malkiye (all in the Kaa-Khemsky District). Smaller ultra-Orthodox settlements are found further upstream. Tuvans are closely related ethnically and linguistically to the Khakas to their north and the Altai to their west, but closer culturally to the Mongolians to their south and the related Buryats to their east, with whom they share their Tibetan Buddhism. During the 16th and 17th centuries, Tibetan Buddhism gained popularity in Tuva. An increasing number of new and restored temples are coming into use, as well as novices being trained as monks and lamas. Religious practice declined under the restrictive policies of the Soviet period but is now flourishing. Shamanism is being revived as well, also in organized Tengrian forms. As of a 2012 survey 61.8% of the population of Tuva adheres to Buddhism, 8% to Tengrism or Tuvan shamanism, 1.5% to the Russian Orthodox Church, the Old Believers or other forms of Christianity, 1% to Protestantism. In addition, 7.7% follows other religion or did not give an answer to the survey, 8% of the population declares to be "spiritual but not religious" and 12% to be atheist. 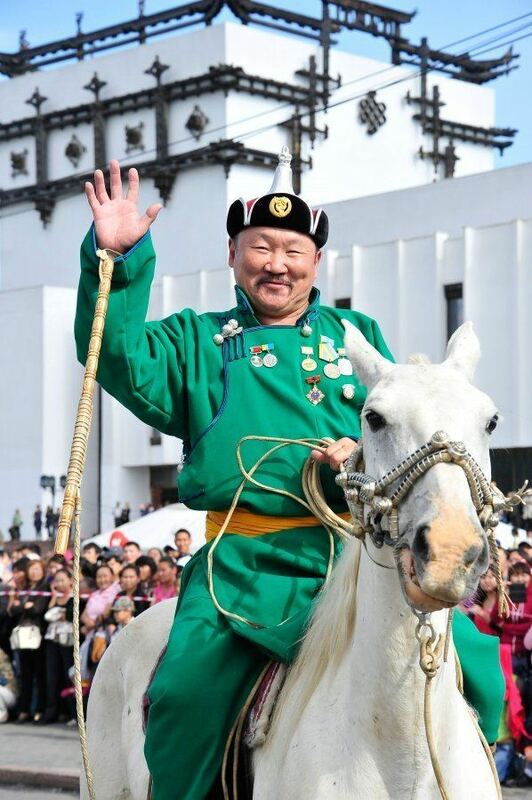 The head of the government in Tuva is the Chairman of the Government, who is elected for a four-year term. The first Chairman of the Government was Sherig-ool Oorzhak. As of 2007, the Chairman of the Government was Sholban Kara-ool. Tuva's legislature, the Great Khural, has 162 seats; each deputy is elected to serve a four-year term. The present flag of Tuva – yellow for prosperity, blue for courage and strength, white for purity – was adopted on September 17, 1992. See above under Religion. The republic's Constitution was adopted on October 23, 1993. On April 3, 2007, Russian president Vladimir Putin nominated Sholban Kara-ool, 40, a former champion wrestler, as the Chairman of the Government of Tuva. Sholban's candidacy was approved by the Khural on April 9, 2007. Tuva has a developing mining industry (coal, cobalt, gold, and more). Food processing, timber, and metal working industries are also well-developed. Most of the industrial production is concentrated in the capital Kyzyl and in Ak-Dovurak. According to the HDI, the republic of Tuva is the least developed region in Russia. Tuva is a region with a unique history, culture and nature. All native zones of the Earth except savanna (even rain forest, see Southern Siberian rainforest) are featured in Tuva. Tuva is well known for its spa-tourism. There are more than 100 mineral springs in Tuva. The biggest of them are the warm mineral springs Ush-Beldir and Tarys, the temperature of the water is 52-85 °C. Cold mineral springs and salty lakes are popular among tourists and the general population for their medicinal qualities. 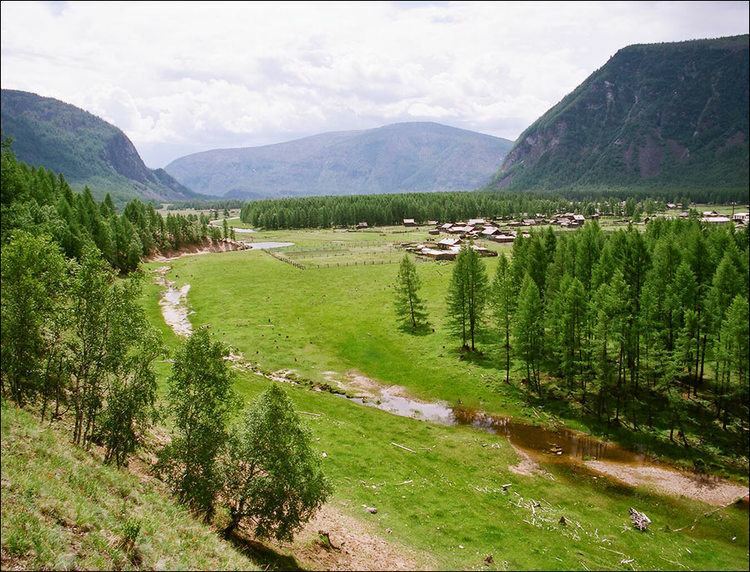 The geographical location of Tuva between the east-Siberian taiga and central-Asian landscape engenders a wealth of flora and fauna. More than 90% of the territory is chase. Rare animals such as sable, lynx, wolverine, weasel, maral, Siberian ibex, and musk deer are part of Tuvan fauna. Historical objects and ethnic culture are of interest: traditional habitat – yurts, national cuisine and handicraft, tuvan throat singing khomeii, national sports – wrestling competition Khuresh and horse riding. Annual festival "Ustuu-Khuree" and Naadym are of interest to tourists. Other places of interest include The Center Of Asia monument or the Old Believers village - Erzhey. 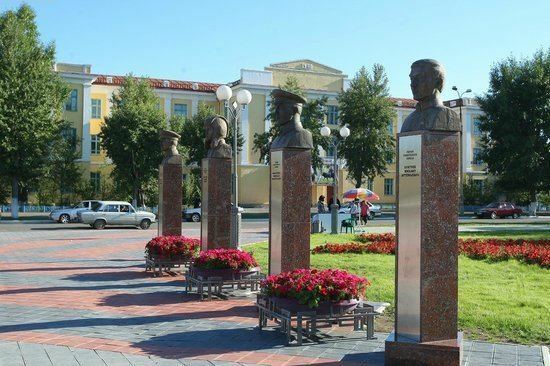 The ethno-Cultural Park " Aldyn-Bulak"
Tuva has as yet no railway – although famous postage stamps in the 1930s, designed in Moscow during the time of Tuvan independence, mistakenly depict locomotives as demonstrating Soviet-inspired progress there. There is however a plan for construction of a railway line from the capital Kyzyl to Kuragino in Krasnoyarsk Krai. The railway will run for 410 kilometers (250 mi). The main purpose for building the railway is to transport coal from coal mines in Kyzyl. There are three roads leading to Tuva, a paved highway over the passes between Khakassia (Abakan) and Kyzyl and a dirt track over the mountains from Khakassia to Ak Dovurak,: both of these can be cut off by snowfall and avalanches from time to time in winter. The third road goes south, turning into a track before entering Mongolia. The only external bus and taxi services are between Khakassia (Abakan) and Kyzyl. Kyzyl has both large public buses and private minibus services. Both buses and taxis also connect Kyzyl with the larger settlements. Passenger ferries ply the Greater Yenisei (Bii-Khem) between Kyzyl and Toora-Khem in Todzha (Upper Tuva) when there is neither too little nor too much water over the rapids. There is a small airfield in Kyzyl with intermittent flights. Tuva has a rich cultural potential, which provides the population with wide access to cultural values, knowledge and information. An important feature is the high safety of traditional culture, successfully developing professional art. Traditional culture of Tuvan people, of the new population of the republic, is culture of nomads Central Asia. Tuva is an agrarian republic. The main branch of agriculture is livestock breeding (mainly sheep breeding and meat and dairy cattle breeding); also goat breeding and horse breeding are developed. In the tundra, reindeer are bred, in the mountains - yaks, south, in the semi-desert, - camels. Tuva is attractive to rich historical cultural heritage, preserved ethnic culture of the local population. The world famous was the Tuvinian-throat singing (khoomei). This type of can be heard, in particular, during the speeches of the Tuva National Orchestra. The Tuvan people are famous for Tuvan throat singing. Khuresh, the Tuvan form of wrestling, is a very popular sport. Competitions are held at the annual Naadym festival at Tos-Bulak. Sainkho Namtchylak is one of the few singers from Tuva to have an international following. Namtchylak is also very involved with Tuvan culture. Every year she invites Western musicians to perform in Kyzyl and to learn about the country, its culture and its music. In recent years Kongar-ool Ondar has become well known in the West as well, in large part because of the film Genghis Blues featuring Ondar and American blues singer Paul Pena. Huun-Huur-Tu has been one of the most well known Tuvan music ensembles since the late 1990s, while the Alash ensemble came to prominence in the early 2000s. Tuva is one of the few places in the world where in the original form is preserved shamanism part of the traditional culture of Tuva. Shamanism presupposes the existence of good and evil spirits inhabiting mountains, forests and water, the heavens and the underworld. The mediator between man and the spirits of the shaman. It is believed that with the help of spirits the shaman is able to cure patient, to predict the future. In Tuva shamanism peacefully coexists with Buddhism. Buddhism is associated with many folk rituals, calendar holidays, and folk medicines in Tuva. Centers of Buddhism in Tuva are Khuree – temples, temple complexes. The temple complex Tsechenling in Kyzyl – the residence of Kamba-Lama, head of Buddhism in Tuva. In the Orthodox churches go bogolotion, and in some remote settlements where ancient times live russian conservatives, all the features of their way of life are preserved. Old believers, persecuted by the Russian authorities, came in Tuva in the end of XIX century. They were about a third of all Russian immigrants, who in search of a better life in the centre went to Asia. Old believers settled in the upper reaches Yenisei, the current Kaa-hemsky and Tojinsky districts. Treasures of the old Slavonic culture in the Asian Tuva saved along with the values of other peoples – children's folklore ensemble "Oktay" from the city of Kyzyl in the course several ethnographic expeditions In the old believers ' settlements were able to collect and record of conservatives extensive collection of samples of ancient singing art. Traditional culture of Tuvan life – this Yurt – dwelling nomad, and national cuisine and folk arts and the craft, among which a special place is carving soft stone (agalmatolite). And of course, the archeology of Tuva. Excavations archaeologists of ancient burial mounds bring sometimes these discoveries, which for a long time determined in the excitement of the whole scientific world. So, the symbol of ancient Tuva became coagulated ring amazing beauty of bronze panther VIII century BC, discovered in the excavation of barrow Arzhaan-1. Rich a Scythian burial was discovered in 2001, during the excavation of barrow Arzhaan-2. Collection of gold jewelry from this burial is demonstrated now in the specialized hall of the National Museum Aldan-Maadyr in Kyzyl. The development of cultural potential of the region is facilitated by the organization of festivals aimed at expanding interregional and international cooperation aimed at strengthening the image of the region, supporting cultural innovations: the ecological film festival "The Living Path of Dersu", the Interregional Festival of National Cultures "Heart of Asia". It has become a tradition to hold the international festival of live music "Ustuu-Khuree", the International Symposium "Khoomei - the Phenomenon of the Culture of the Peoples of Central Asia", the Regional Competition-Festival of Performers on National Instruments "Dingildai", the International Felt Festival "Patterns of Life on Felt" Pop songs "Melodies of the Sayan Mountains". The Tuvan people have a rich tradition of orally transmitted folklore, including many genres, ranging from very brief riddles and aphorisms, to tongue twisters, magical tales, hero tales, scary stories, and epics that would take many hours to recite. A few examples and excerpts of the epic genres, such as Boktu-Kirish, Bora-Sheelei have been published. This art form is now endangered as the traditional tale-tellers grow old and are not replaced by younger practitioners. The most important facilities of higher education include the Tuvan State University and the Tuvan Institute of Humanities, both located in the capital Kyzyl. In the 1920s and 1930s, postage stamps from Tuva were issued. Many philatelists, including the physicist Richard Feynman, have been fascinated with Tuva because of these stamps. The stamps were issued mainly during the brief period of Tuvan independence, and were not accepted by serious collectors until recently as they were thought to be produced in Moscow and not to represent a genuine postal service. Feynman's efforts to reach Tuva are chronicled in the book Tuva or Bust! and the video The Quest For Tannu Tuva: Richard Feynman – The Last Journey of a Genius (1988) which can be viewed online on YouTube. Project Tuva was named in honor of his efforts. Some Tuvans, even near Kyzyl, still live in traditional yurts, round, demountable and portable dwellings with sectional lath trellis walls, decorated pole roofs and covered with white felt and canvas, with colourful cloth lining. There is a central smoke-hole above the hearth or stove. It is used to tell the time as the sunlight moves around inside the yurt. The interior is arranged with the man's side to the left, the woman's to the right of the door facing East, with the altar cupboard facing that. Sayan Mountains in Tuva was featured in Bear Grylls' Man vs Wild popular adventure TV show.